How do you strap an 87-ton Space Shuttle to the back of a 63 foot-tall 747? You use this metal monstrosity. Or, you did, before the program ended in 2011. Now, after nearly four decades of service, NASA's tearing it down. While the space shuttle orbiter could circle the Earth with ease, it was entirely incapable of a simple cross country flight. So when one would set down at Dryden Flight Research Center after a mission, it would need to be shuttled back to Cape Canaveral. To do this, NASA devised the awesome solution of strapping it to the top of a modified 747-100, known as the Space Shuttle Transporter, like mounting a bike on the roof of a car. 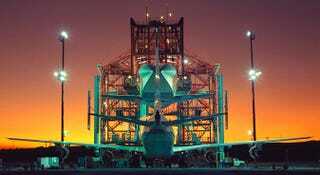 To lift the 85-ton space shuttle orbiter into position above the plane, NASA employed the Mate-Demate Device (MDD): A behemoth steel gantry crane system capable of hoisting as much as 240,000 pounds (120 tons). NASA built it in 1976 at a cost of $1.7 million. The system utilized a central beam strung between a pair of 100 foot-tall towers that could be raised and lowered by a trio of 50-ton-rated hydraulic lifts. Each tower has work platforms set at 20-foot vertical intervals up their sides, which aided in performing maintenance work on the shuttles as well. But, unfortunately, the days of the manned orbiter mission are over now. It's been three years since the end of the program and six years since the MDD at Armstrong was actually used. "It's sad to see something like this go, especially because it has a lot of history," George Grimshaw, the center's last shuttle landing and recovery manager, told SPACE.com. "There is really nothing like it around. Yet, at the same time, you just can't have facilities sitting around unused, wasting away."